Helpdesk support - IAI industrial systems B.V.
Helpdesk Support is available via several media. The Helpdesk can be contacted by filling in the helpdesk contact form, by direct phone number (+31 40 2185005) or by email (service@iai.nl). Phone support hours are between 8:00 until 17:00 (CET) from Mondays to Fridays. Our technically skilled and experienced service desk engineers are ready to answer your questions about your IAI equipment. 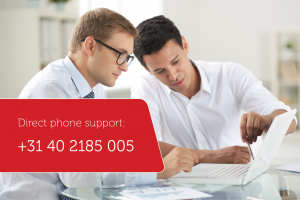 After office hours, your call will be forwarded to one of our Service Engineers to offer you first line support in emergencies. Response Time is the time window in which IAI will start solving a problem after it has been reported. Response Time can be variable for each project or customer and is determined in your maintenance agreement. The annual number of Helpdesk Support hours is also determined in the Maintenance Agreement. When the limit is almost reached, IAI will inform you.